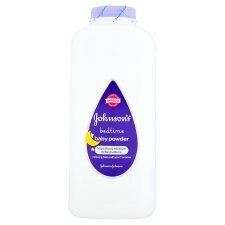 Johnson's baby bedtime powder is perfect for baby soft skin. It reduces the effects of rubbing and chafing and contains relaxing NaturalCalm™ aromas. WARNING: Keep powder away from children's nose and mouth. Inhalation can cause breathing problems. Avoid contact with eyes. For external use only.